Greetings all fellow folks in internet land. My brain has just started to settle since finishing the first draft of my latest novel (details to be announced the very SECOND I’m allowed to) and I’m using this time spent away from actual writing to be thinking about the bigger picture. For me, this means promo, events, agents and, yes that’s right, the next novel. Those laurels are dangerous, after all. Avoid them like the plague. So, whereas it’s great to feel I have a breather from a novel draft for a while, I can’t afford to not be making other things happen. First things first, keep an eye out for an incoming interview from author, blogger and diletantte, Helena Hann Basqauit! We talk Alien, anime, Joss Whedon and zealots! Let the agent hunting begin! 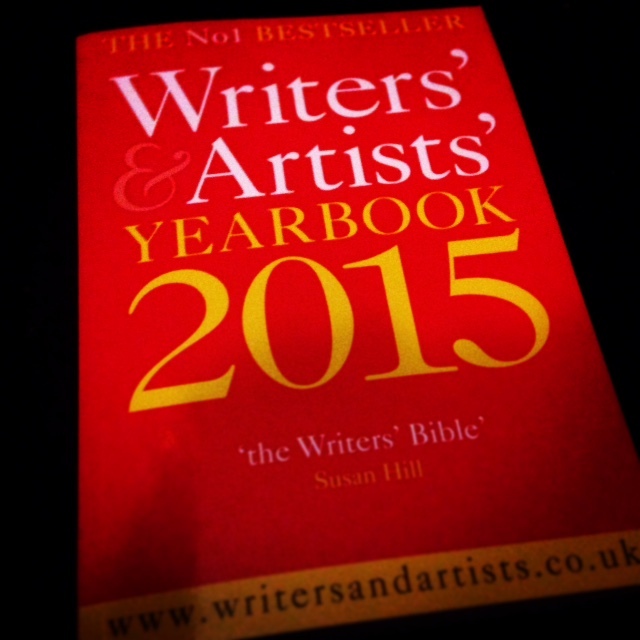 And further to this, my copy of the Artist’s and Writer’s Yearbook 2015 has a arrived! This is officially my first step to trying to find an agent. I already have a few names picked out and I’m going to start putting queries together soon. Yikes. This is scary. I know this will take time. But it will never happen unless I make it so onwards and upwards and time to start really think about what I want to achieve, as well as strengthening my rejection-walls. I’m also booked on my first event of 2015. I will be attending Yorkshire Cosplay Con Sat 4th April 2015! This event looks like it’s going to be amazing fun and a great day for anyone with a love of fantasy, scifi, computer games or just good old-fashioned dressing up! 2015’s event is happening in Sheffield and with earlybird tickets at just £7 each for adults and £5 for children, the event is certainly going to be value for money. I already have at least one glamorous assistant confirmed, who will be dressed as a character from my first SciFi novel Zero (which, incidentally is available on Amazon in paperback and for kindle and raking in the good reviews at the moment!) so do come along and say hello, get your copy signed or pick up a new one and some exclusive Zero merch (details soon I promise). This entry was posted in Musings on Writing and tagged 2015, agents, and orbit novel, artists, artists and writers yearbook, computer games, cosplay, cosplay con, creative writing, fantasy, fantasy fiction, fiction, getting an agent, literary agent, motivation, novel writing, orbit novels, productivity, science fiction, scifi, writing, yorkshire cosplay con, yorkshire cosplay con 2015, zero. Bookmark the permalink. You should see my TBR pile…think I’m going to need assailing gear to get the ones from the top! That’s absolutely find, lovely. I’m so happy you have it 🙂 Thanks so much!